Steerage steward: [going through the steerage corridors, rousing the passengers] Everybody up, get dressed, get your lifebelts on, at once. Everybody up, get dressed, get your lifebelts on, at once. Q: What is a "growler"? Q: What is 'A Night to Remember' about? Q: Is 'A Night to Remember' based on a book? The original adaptation of the "Ship of Dreams", 'A Night to Remember' is a riveting and emotional study of the fateful maiden voyage of the RMS Titanic. 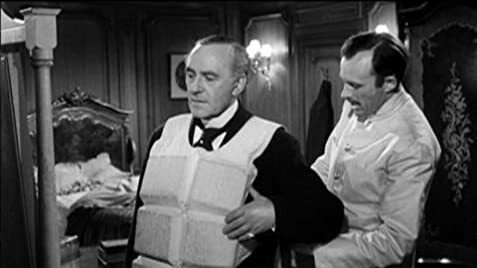 A British production made on location at Pinewood Studios, Roy Baker's meticulous re-creation of the sinking of the Titanic is an utter masterpiece of cinema. The scale of the sets, the ingenuity of the visual effects and the stellar performances all make this a 1950's Brit-blockbuster at its very best. Whilst the '97 adaptation from James Cameron is a powerful piece of cinema, this stunning and melodramatic 1958 flick spends its 2-hour duration focussing on the lives of everybody aboard the ship instead of wandering off to study a love story between two characters. 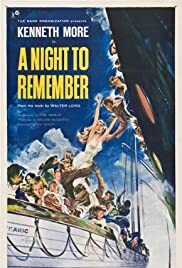 A film that relies on real-life survivor testimony, 'A Night to Remember' is in my opinion the best adaptation of the tale of the "unsinkable" ship and one of the best British films to have ever graced the screen.